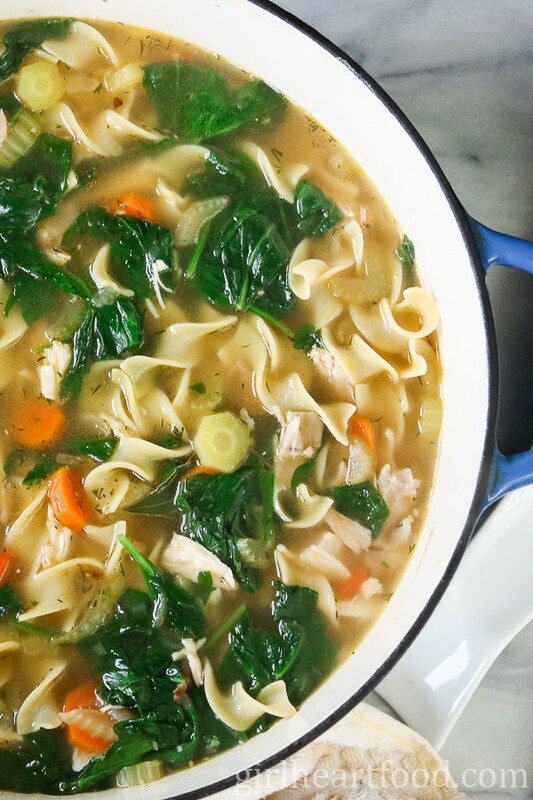 Homemade Chicken Noodle Soup (me – Girl Heart Food) – A classic homemade chicken noodle soup with extra oomph from spinach and fresh dill. Fresh Tomato Apple Soup from Natalie’s Happy Health (pictured below & photo credit) – Who doesn’t love a good tomato soup? This one has a neat little twist on a classic with the addition of apple. Perfect for dunkin’ a grilled cheese sandwich. Mexican Chicken Soup from A Fork’s Tale (pictured below & photo credit) – So much flavour in this soup and love the avocado garnish. Plus, this one is made in the Instant Pot and ready to enjoy in about 30 minutes! White Bean Soup with Parmesan and Pesto from Kitchen Sanctuary (pictured below & photo credit) – This soup gets it’s creaminess from white beans and brightened with fresh lemon juice at the end. Topped with parmesan and pesto, it makes for one delicious lunch! Creamy Vegan Corn Chowder from Rhian’s Recipes (pictured below & photo credit) – I’m a huge corn fan and this one is definitely calling my name. And just look at that pretty colour – so inviting, isn’t it? Creamy Leek and Potato Soup from Our Happy Mess (pictured below & photo credit) – Leeks, potatoes and cream make for one hearty, lush soup sure to warm ya right up on a cold day. Pasta e Fagioli from Pinch and Swirl (pictured below and photo credit) – This classic Italian soup is loaded with goodies like pasta, veg and sausage. It’s super substantial so would make a hearty lunch or dinner. Don’t forget the crusty bread! German Potato Soup from Tasty Ever After (pictured below & photo credit) – with ingredients like bacon, leek and potato, there’s no going wrong! Easy Broccoli Cheese Soup from Wholesome Yum (pictured below & photo credit) – This low carb 5 ingredient (yes, FIVE ingredient) soup is ready in 20 minutes and look how cheesy it looks! I think I may have to have a couple of bowls of this one. Chicken Mushroom Soup from Salt and Lavender (pictured below & photo credit) – Made in just over 30 minutes, this hearty chicken mushroom soup comes together so quickly with the use of leftover chicken. 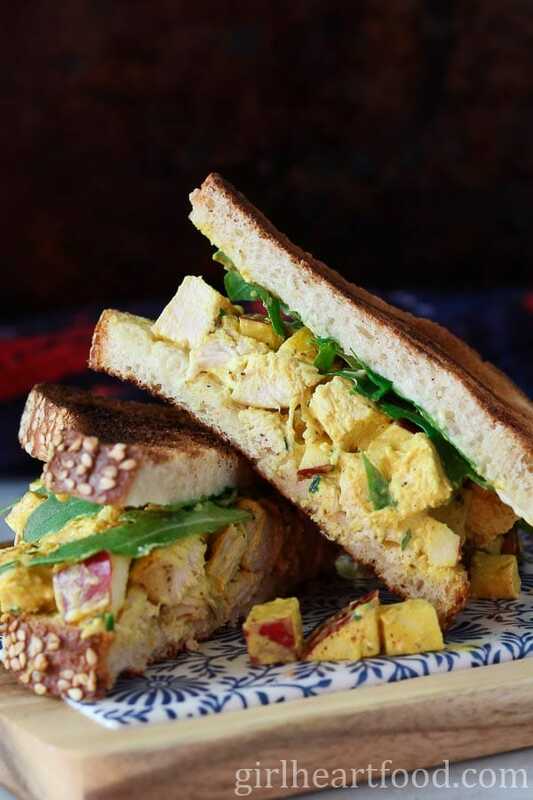 Curry Chicken Salad Sandwich from me ( Girl Heart Food) – Not sure standard chicken salad sandwich recipe! This one has curry and diced apple to make it extra special. Crispy Prosciutto Sandwich from Love In My Oven (pictured below & photo credit) – This sandwich is delicious for lunch, but would also make for one awesome way to start the day! Hawaiian Sandwiches from The Cozy Cook (pictured below & photo credit) – I absolutely adore sliders. Somehow, you can totally eat more than one and that’s completely acceptable. These have a lovely savoury/sweet combo with ham, cheese and pineapple. Avocado Ranch Chicken Salad Wrap from Spend with Pennies (pictured below & photo credit) – Avocado and ranch go hand in hand like this should be in my hand! Seriously delish! Chickpea Sloppy Joes from Champage Tastes (pictured below & photo credit) – I love the spin on a childhood classic. These healthier sloppy joes are loaded with flavour and fibre from chickpeas. Italian Panini with Salami, Fontina, Arugula, and Sun-Dried Tomato Mayo from Ciao Chow Bambina (pictured below & photo credit) – This panini has all the flavours you could possibly dream of in a sandwich, especially with that sun-dried tomato mayo – a personal fave. Crispy Chicken Sandwich from Sweet Tea and Thyme (pictured below & photo credit) – Crispy Chicken. Two words that belong together. Slap that on a bun with bacon and garlic ailoi and you’ve got one awesome lunch. Skinny Italian Tuna Salad Wrap from Delicious Table (pictured below & photo credit) – Tuna salad is definitely a lunch time classic! This one is lightened up a bit with yogurt. Avocado Chickpea Salad from Looney for Food (pictured below & photo credit) – Made with only 7 ingredients, this sandwich is not only healthy, but hearty! Avocado adds a creaminess to this delicious sandwich. Grilled Beer Marinated Steak Sandwich from Craft Beering (pictured below & photo credit) – This is one substantial sandwich, perfect for a Saturday lunch date. Soup and sandwiches are classic for a reason. Hope you’ve found some inspiration here to mix up your lunch routine. So, tell me, what are your favourite soup and sandwich recipes? I’d love to hear! What a great collection of recipes! The soup and sandwich combination is real comfort food! Probably one of my fav comfort food combinations! I love soup & sandwiches, especially together for lunch or dinner. SO many great options – what a wonderful roundup! I had tomato soup and a grilled cheese sandwich last night! Soup and sandwiches are such a yummy dinner- and thanks for including my sloppy joes!! YUM! My pleasure 🙂 !! What an amazing selection of comforting soup and sandwich recipes. There is something nothing better than a warming soup and I love a good sandwich for lunch! Have a great week, Dawn! This is a great collection! Now how many different combinations can I make??? 🙂 I think I have lunches set for quite awhile now. Oh jeez, I’m pinning the heck out of this post. I’m on a soup kick these days so this post is right up my alley. Plus, the sandwiches look on fleek! (I’m 40, am I allowed to say on fleek or is that trying too hard :D). Not much will set your day right better than soup and sandwiches. What a great roundup! So true 😉 Thanks Kevin! OH MY GAWWDD, this is some tasty looking food! I can eat soups and sandwich any time of the year, but especially right now, because it still feels like winter here in NH. It literally snowed this morning for 2 hours!!! I’m making some soup this weekend with one of these recipes AND I’m making your curried chicken salad soon. Love that sandwich! It’s hard to beat a good soup and sandwich combo! Spring is the perfect time for these recipes as it’s still a little bit chilly in the air. Any of these would make for a great lunch this weekend…especially that steak sandwich! Thanks so much for including my soup! 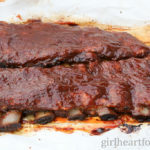 This post is making me hungry!! One of the great things about living in Newfoundland is that it always seems to be soup and sandwich weather! Such a great round up Dawn! Happy Thursday! So true!! Thanks Leanne 🙂 Happy Friday! Such a great roundup! I want to try everything! Thanks for including my avocado chickpea salad! Always in the mood for soup and sandwich over here 😉 Thanks Kelsie! Happy weekend to you too! Such a fabulous list of soups and sammies Dawn! Still chilly around here, so this comes at a great time! Happy weekend!